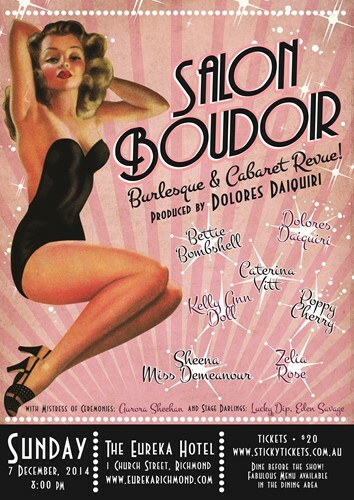 Salon Boudoir - Burlesque & Cabaret Revue! Salon Boudoir is an exciting burlesque and cabaret revue consisting of burlesque showgirls, cabaret divas and vaudeville vamps!! A vintage-flavoured, glamorous and decadent showcase of classic burlesque, comedic antics, songstresses and cabaret delights. The cast is star studded with some of the best in the country. Why not celebrate with Salon Boudoir during the festive season. Bring your friends, colleagues or anyone who likes there entertainment stirred with a twist of sophistication. Perfect for Xmas events, work functions, Hen's Nights, Special Occasions or just a night out with friends. Fabulous menu available in the dining area. They have a fabulous selection of food. Dine before you eat then see the show.